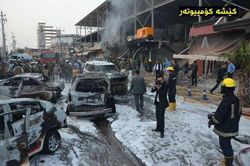 On Twitter, ISIS is claiming credit for the car bomb attack today outside the U.S. embassy in Erbil. They say it was done by fighters in their Kirkuk division. A Kurdish security official told McClatchy that three attackers approached a checkpoint near the consulate in an SUV apparently with the intention of attacking it on foot to make room for a suicide bomber, who was either on foot or in the car. They were spotted by peshmerga security forces stationed outside the consulate, who opened fire. The security official said the three attackers were killed, though whether they were killed by gunshots or detonated explosives was unclear.